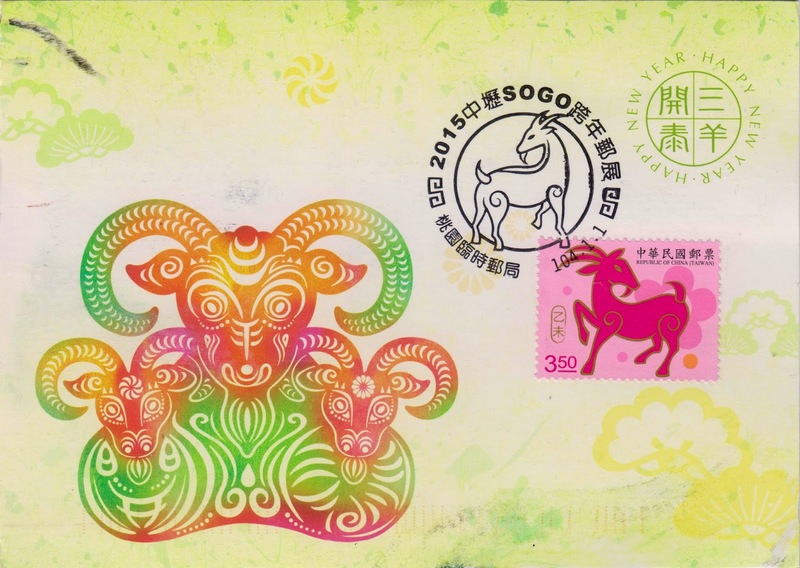 My first the Year of the Ram postcard arrived from Taiwan today. It's a maxi card featuring a colorful sheep in paper cut art. The NT$3.5 stamp, with the image of a sheep stepping gentle pace over plum blossoms against a pink background, is part of a two-stamp set issued by Chunghwa Post in Taiwan on December 1, 2014 to welcome the spring and bring good fortune. The Year of the Ram begins on February 19, 2015, and ends on February 7, 2016. USPS will also issue the Year of the Ram stamp as a Forever stamp in self-adhesive souvenir sheets of 12 in San Francisco, CA on February 7, 2015.